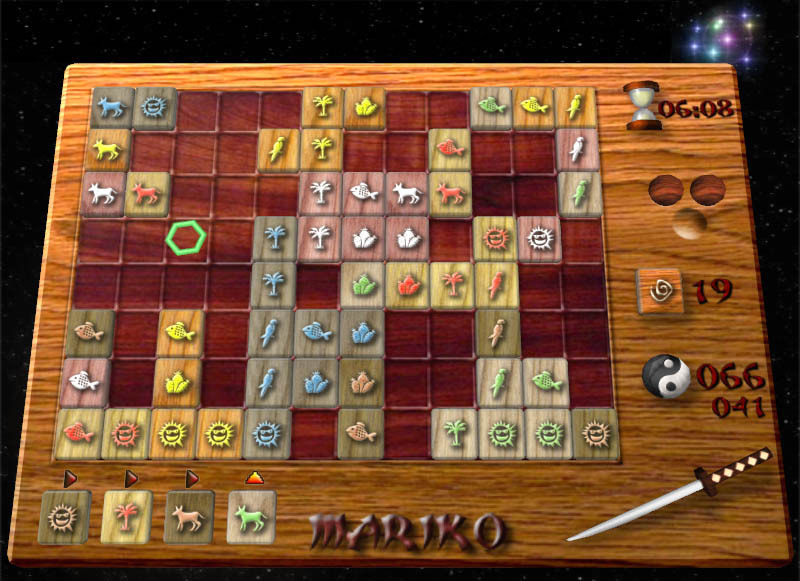 Mariko 3D is a remake of the popular tactical game Ishido, an ancient japanese board game. You are given a set of 72 tiles, each marked with a specific color and figure.The stones are presented one at a time, and you place them on a board with 96 slots. You have to fill up the board as much as possible with stones in a specific way: each of them can be places only adjacent to a stone that shares either its color or its figure. The more stones that your stone touches, the more points you earn for that stone. The game is won by making the highest score possible, but you will quickly find other goals to achieve, such as using all the tiles or scoring four-way matches around the starting board. Like all great board games, Marikos concept is deceptively simple, but offers a deeply complex and challenging experience. Mariko proofs that a game does not need many rules to be sophisticated. The concept is simple, yet each new move offers a wealth of possibilities to be explored, making this a perfect entry for the deep-thinking strategist. The game has a tutorial and a training mode for the beginner. 14 different difficulties (level), for example: time limit per move, provides for new challenges. The full version contains four layouts with different tile sets.